COFFS HARBOUR SLIPWAY BUILDINGS DEMOLITION – All Areas Demolition Excavation were selected by the NSW Department of Trade & Investments, to carry out the demolition of two buildings located at the Coffs Harbour Slipway. 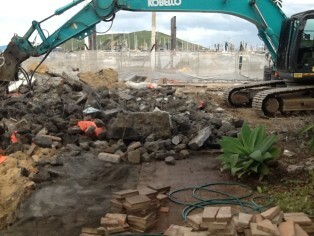 Due to the sensitive location of these buildings, alongside the waterway at Coffs Harbour Jetty, every precaution was taken to prevent any contamination from entering the waterway during the demolition process. All Areas Demolition Excavation are proud to have completed the demolition of these buildings to enable the progression of the Coffs Harbour Slipway Upgrade to continue. Please click on the video to watch the time lapse progress of this demolition.